The embedded industry has been hard to define because traditional and emerging embedded markets are very different. 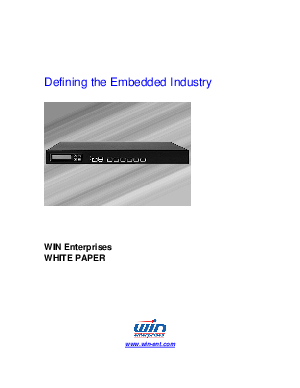 Traditionally, embedded solutions applied to industrial control, networking IT, military, medical and other specialized markets. Handheld mobile devices and home networking technology is now often included when sizing this market greatly increasing its size. This paper helps clarify the overall embedded market and the relationship of the traditional and emerging markets.